Welcome back to Eleven Gables Christmas Home Tour (part 2)! If you missed part one, don't worry, you can catch up HERE! 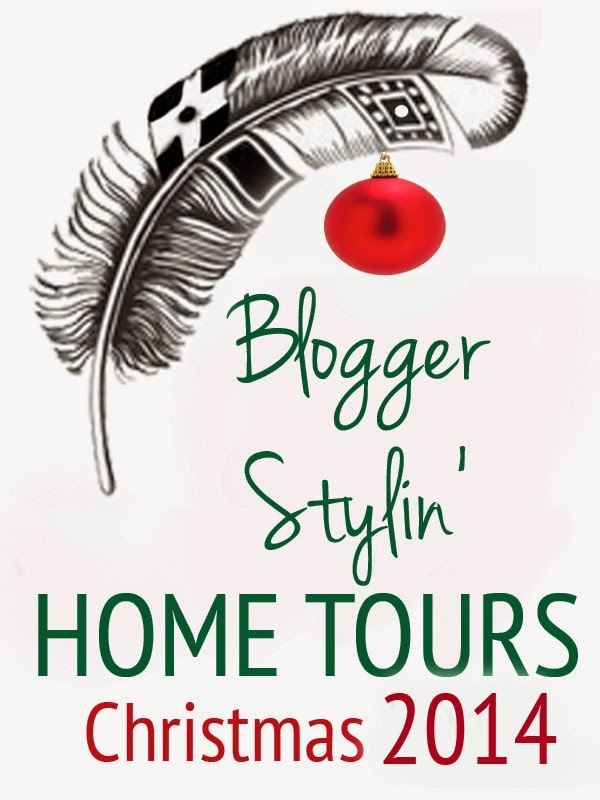 I am so thrilled to be participating in another installment of Blogger Stylin' Home Tours hosted by Lindsay of The White Buffalo Stylin' Co . If you are joining me from Jenna at Rain on a Tin Roof, Welcome!! 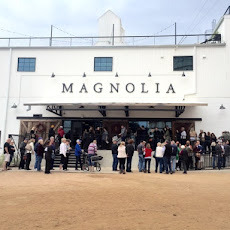 If you missed her tour, be sure and stop by. 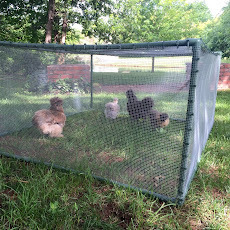 Today, I am showing you around the kitchen and keeping room. The new kitchen is where we spend the majority of our time, so it was important to keep the decor clean, simple, and colorful. Blue and White is the anchor in my kitchen. My wedding dishes are Spode Blue Italian. I loved adding in Red and Green this Christmas. My boys decorated this gingerbread house all on their own. This year, I purchased a preassembled gingerbread house and it made a world of difference with the littles!! For my kitchen tree, I dug out my copper cookie cutters and tied them to the tree. The vent hood mantle got a fresh boxwood wreath with a red bow and little deer mount. The hot chocolate station is ready to go!! 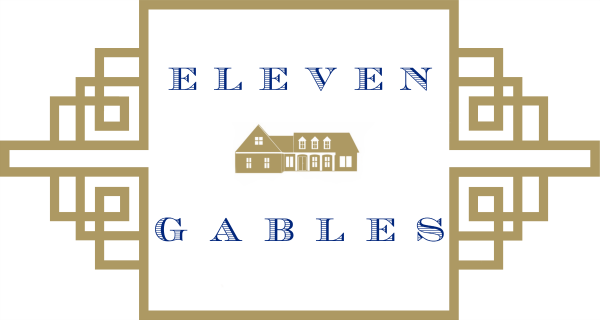 2015 will bring new slips to Eleven Gables! The floral needs to go! But Mr. Eleven Gables put the breaks on my shenanigans this year after the porch remodel. The plaid wreaths on the windows were my mother's. The side table holds china ornaments and sharpies at the ready for my whims! My latest hobby is hand "painted" ornaments. I wrote an easy tutorial for you HERE. Thank you for coming on my Christmas Kitchen tour! Next week, I will feature an easy & delicious cocktail you will definitely want to keep in your Holiday Pinterest file!! Next up on the tour is Burlap and Lace! Oh my gosh do I love your kitchen with that rug and the brick flooring. Such a pretty tour. Your home looks absolutely beautiful all dressed for Christmas!! Love the boxwood wreath over your stove and I love those plaid wreaths that were your moms! I love it all! Just curious what is to the left of your stove? Noticed that it's not a regular cabinet?? Love love Emily! The part about Mr. Eleven Gables made me giggle! :) Love those misters!!! We have the You are Loved plate too...it was our birthday plate growing up and then Mom got me one when I got married. I think you've uncovered a new business with your hand painted ornaments...wink, wink...etsy shop?! Love them. Are the "You are Loved plates" available anywhere that you know of? I love using it for Christmas, but also love the birthday plate idea! Would love to get them for my 4 adult "kids" to use for their children's birthdays! Sweet tradition! I love your warm home, Emily and that first shot with the bright Merry Christmas banner is so fun! 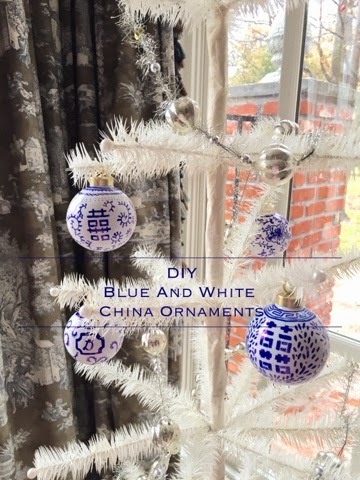 Your blue and white ornaments are amazing, I'd love to try! :) Merry Christmas to you and your cute family! Thank you so much, Pam! I am already thinking about how I'll be decorating for next Christmas. You have inspired me. Love your style! Merry Merry Christmas to you! Awe, Kristin. Thank you, sweets. I am smitten with your pink... I even dreamed about it!! Merry Christmas, friend! Oh I love your kitchen, so beautiful. Your home is stunning and so pretty all dressed for Christmas. Marty, you are so sweet! Thank you, dear! Merry Christmas! So warm and welcoming!! I love the darling little tree in your kitchen and the outside pictures of your home are just magical!! Stunning! Love the handmade ornaments. Thank you so much! Merry Christmas!! Bravo, Emily! I love your happy little banner, the brass bowl full of ornaments, and of course those awesome blue and white china ornaments. I could waste the day away sitting in your cozy house! Merry Christmas! Jennifer, you are so sweet! I wish you would waste the day away here in my house with me. I could use your styling touch on a built-in that I am stumped on! Merry Christmas, sweet friend! 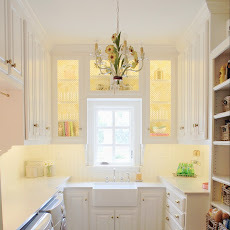 So pretty ... all the colours bouncing off the white kitchen!!! LUV the home made ornaments! Beautiful tour! I love your colorful Merry Christmas banner in the kitchen window! Beautiful!! I want to come curl up on that amazing porch!! So beautiful! You have a lovely home, and it looks so festive! emily, your home is just so stunning and your pictures look amazing!!! hope everyone is on the mend! Timeless. Elegant. Charming. Inviting. These are a few of the many words that come to mind when I take your home tour! I love how you used the wreaths and red bows to tie everything together into one big Christmas bow. I also love how your Christmas decorations have such meaning and thoughtfulness behind them. So many Christmas decorations out there seem so random, but yours have reason for being present. I also love how your decorations create intimate spaces for gatherings. I want to spend Christmas morning brunching in your kitchen! You have created a haven of beauty and joy! Thank you for sharing and inspiring with your signature decorating style! Your home is gorgeous! I love the red and green with the blues and whites! Beautiful Home!! Where did you get your bar stools? Your home is beautiful! Four boys! I have three and it's a zoo lol. I really enjoyed your tour. Thanks for sharing your lovely house decorated for Christmas. Everything is just gorgeous! Love the plaid dishes!! I would love to see your floor plan of your home. Is it published on this site? What did you do to your brick floors?